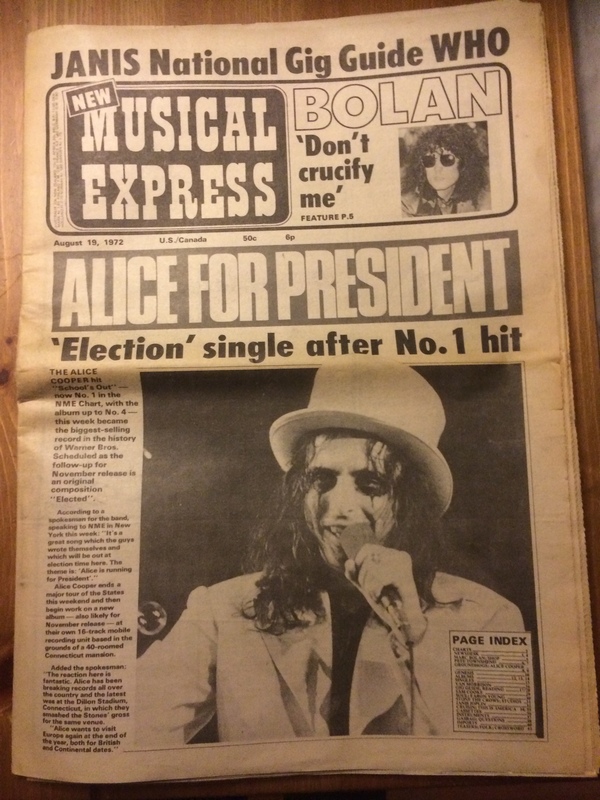 ARTICLE ABOUT Alice Cooper FROM NEW MUSICAL EXPRESS, AUGUST 19, 1972 | My Things - Music history for those who are able to read. 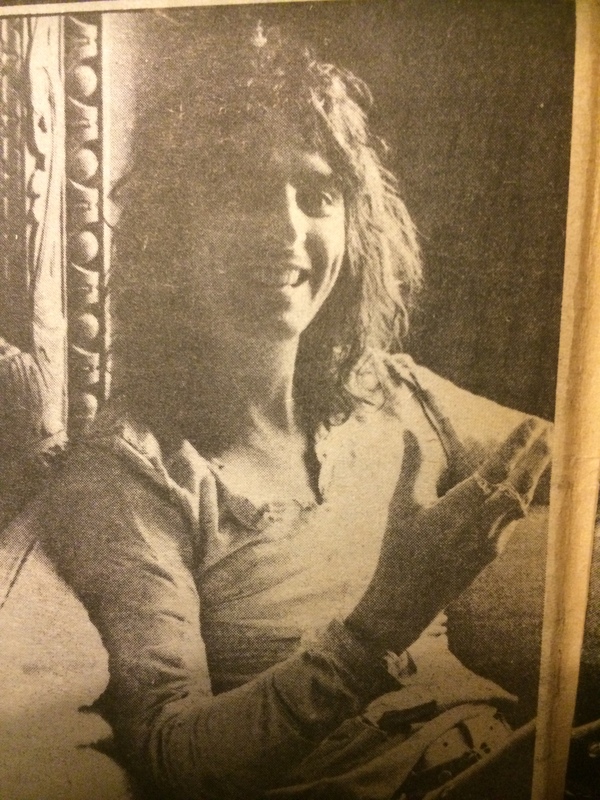 The first Alice Cooper album I bought was “From The Inside”, released at the end of 1978, and I became an instant fan. If the only Alice Cooper song you have heard is “School`s Out” or “Poison”, then I envy you for the chance that you have to discover this absolute goldmine of recorded treasures. Dining with a man named Alice is still a weird experience. The maitre d` blanched when he saw us coming, Alice resplendent in lightly-rouged cheeks, savagely-mascaraed eyes that were highlighted by an intriguing wagon-wheel spokes effect, and a half-opened multi-colour see-through blouse. Complementing him perfectly was Alice`s drummer, Neil Smith. Neil`s dangling ear-ring in the right lobe was partially obscured by his flowing hair, but his patterned, basically-white, loose outfit was offset by a massive turquoise bracelet, a sizeable turquoise ring, and a huge chain necklace. “The dining room is closed…uh…sir,” the maitre d` hastily explained. The diners did their best to look elsewhere, but inevitably all eyes returned to Alice and Neil. “Man, this dining room better be closed when the next person comes,” Alice informed the maitre d`. The coffee shop clientele was similarly bemused but no effort was made to bar the doors there. Alice and Neil, probably because of lengthy exposure to such matters, appeared not to notice the furtive glances around them. The waitress came, fighting valiantly to be nonchalant, and scurried out to the kitchen. Neil grinned. “Rock and roll should be shocking,” Alice theorised. “Remember how great rock and roll used to be? The parents hated it, of course, and that`s one reason it was so much fun. But America has never really had a great rock and roll band with a wild image. Morrison had made his image quickly, remember the famous Miami concert when the late Doors leader casually opened his trousers and committed what was generally considered an indecent act. That`s the kind of showmanship that Alice envies. The old hard-sell. “It doesn`t matter what you do, so long as you get a reaction from the audience,” is the Cooper motto. Neil Smith, brushing his over-shoulder-length hair away from his face, agreed passionately: “When we first started, people used to walk out on us by the thousands. “That was cool, too. You`ve got to get some kind of reaction and even if it`s completely negative, that`s great. Now we get just the opposite reaction. It`s the old rock`n`roll star type of trip and we like that even better. “Did you see those crazy kids rush us after the show tonight? It`s been like that wherever we go lately. All these kids seem to get a great kick out of showing their affection by taking everything we own off us. Audience response to the Alice Cooper Band has changed markedly since the day three years ago when Alice threw his first chicken at the audience and methodically beat a watermelon to bits with a hammer. All in the name of art. Of course, not everyone regarded the early Cooper performances as great art. There were indignant protests against the “chicken killers” when all that could be found of Alice`s chickens after the shows were battered carcasses. Beneath the brassy exterior, the mascara, rouge, and jewellery, is a clever but sensitive mind. Alice wants to be regarded as a rock and roll great, and correctly realises that theatrics is the only way to make it work. Ask Jerry Lee Lewis or Elvis. “We have a better idea how to perform now,” Alice noted. “When we first started at art school in Phoenix, we just knew that we wanted to shock the people and have fun. Neil Smith admits that he was nervous in the beginning: “It wasn`t easy to do the things we did – at least at first. The only way I could go on stage was to get completely stoned. The first few gigs I was so stoned I hardly knew what I was doing. He pulled up his shirt to reveal a bottle of beer stuck in his waist-band. “I always have a spare,” he commented blithely. You really wouldn`t expect this carrying on to be easy for a minister`s son like Alice. Not all his father`s parishioners back home in Phoenix are ecstatic about Alice`s chosen profession. “People ask him why he doesn`t do something about me. He tells them that he has no right to interfere with whatever I do. Anyway, he really likes what I`m doing. He flew up from Detroit to see us and thought it was great. “Is there any reason why he shouldn`t like us?” Alice was still ignoring the curious stares from around us. “What we`re doing is putting fun into music. People who don`t like us are afraid to have any fun. There isn`t much fun in rock, you know. Virtually nothing about Alice Cooper and company is serious. Life is a continuing round of parties and displays to shock the people. Earlier in the day I met a man who had attended the previous evening`s party without undergoing prior conditioning. He looked like a candidate for the morgue. “When I left, it was just warming up,” he confessed. “We don`t know how to live any other way,” said Neil, looking surprised that anyone could imagine living without nightly parties. “We thrive on the travel and parties. Sitting at home we just get bored.” The entire entourage, including a cast of harlequins, is a travelling party. To anyone who remembers the early Alice Cooper act, that remark seems ludicrous. For it was uncertain whether the repulsive stage antics or the equally repulsive music was responsible for driving the audiences away from the stage. Since then Alice sat down and developed some very effective (which is to say, very suggestive) rock`n`roll numbers to go with the staging. The last Alice Cooper album, “School`s Out”, is now high in the British album charts, the single of the same name taken from it being a No. 1. Even the previous “Killer” set is picking up healthy sales. And that from a group that relies heavily on visual effects. 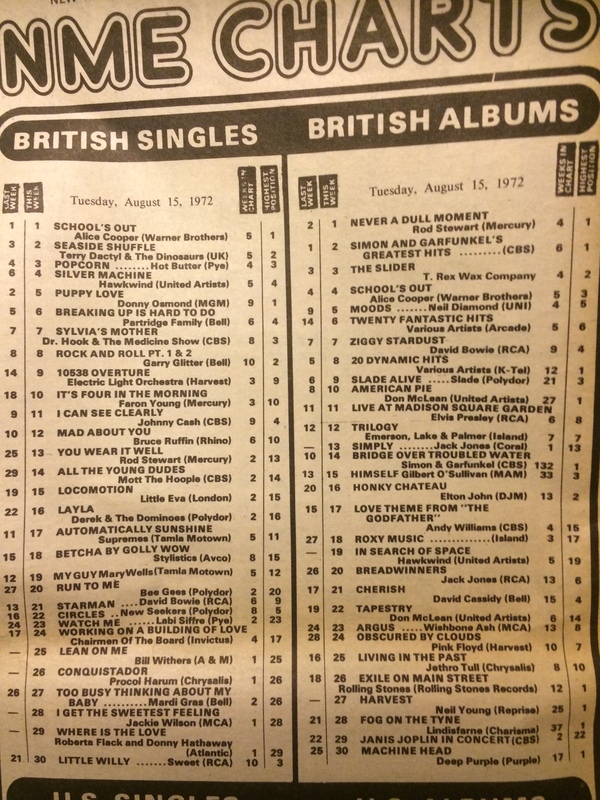 The British charts that week. This number of the NME also contains articles/interviews with these people: Marc Bolan, Phil Townshend (The Who), Genesis, Van Morrison, Reading Festival, Sam Cooke, Stone The Crows, Janis Joplin.